Do you enjoy camping with friends and family but your flashlights burn out and your phone light just isn’t bright enough? For anyone who needs a source of brighter lights, consider thinking outside the box and buying LED lanterns for long-lasting effect. And for the shocking low price of $19.49, you can buy a 4-pack set of LED lanterns from Etekcity, which is currently on sale for 35% off of its original price of $29.99 via Amazon Prime. These set of LED lanterns are ideal for camp sites, porch lighting, front and back yard lighting, nighttime construction, or for bedroom night lights. And with its low battery consumption, you can always count on the Etekcity LED lanterns to brighten your home or business at any time of the day. With these lanterns, you never have to walk, work, or fear the dark ever again. Because of its 30 energy-saving LED lightbulbs and its omni-directional design, its high-intensity luminance can last up to 12 hours. And unlike products from infomercials, batteries are included with this purchase. If battery power happens to run low, the lanterns’ brightness will dim in an energy-saving mode that lasts up to 4-hours. Do you find this product useful but you’re discouraged from having to carry it with you? Not a problem. 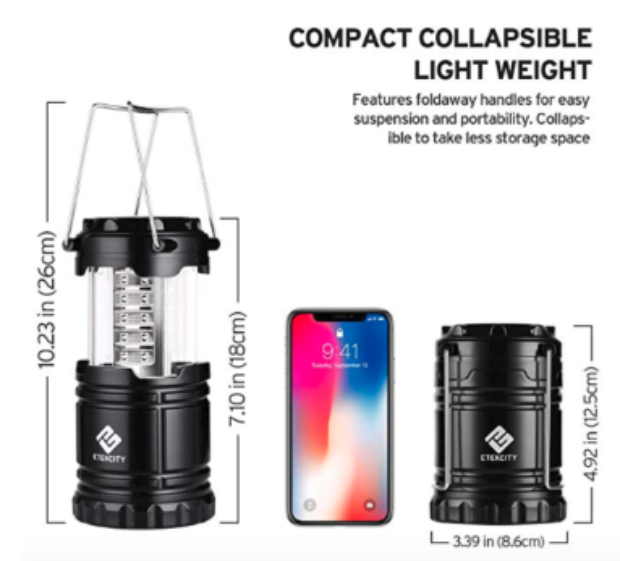 Etekcity has designed these durable, high-quality lanterns to be efficiently portable and collapsible, weighing 9.14 oz so that you can take it with you on any outdoor adventure with ease. More importantly, if you’re ever caught in a hurricane, earthquake, blackout, or another life-threatening emergency, don’t count on your drawer flashlights or phone lights to help you get to safety. Sometimes having the most dependable source of light can save you and your loved ones’ lives. 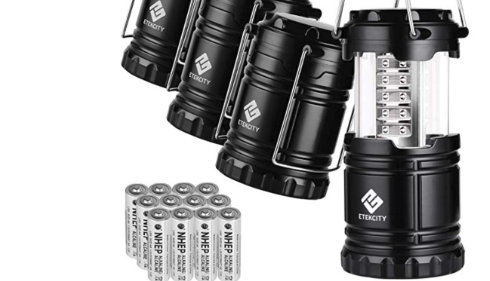 And for Etekcity’s low price of $19.49, you can get a set of 4 LED lanterns that will come in handy for your everyday use.